South Surrey artist Don Li-Leger's installation offers a commentary on homelessness and recycling outmoded forms of information. South Surrey artist Don Li-Leger’s Encyclopedia House art installation in The Grove in Newton formally opened last Friday. The temporary structure is to remain at the site for the rest of the month. 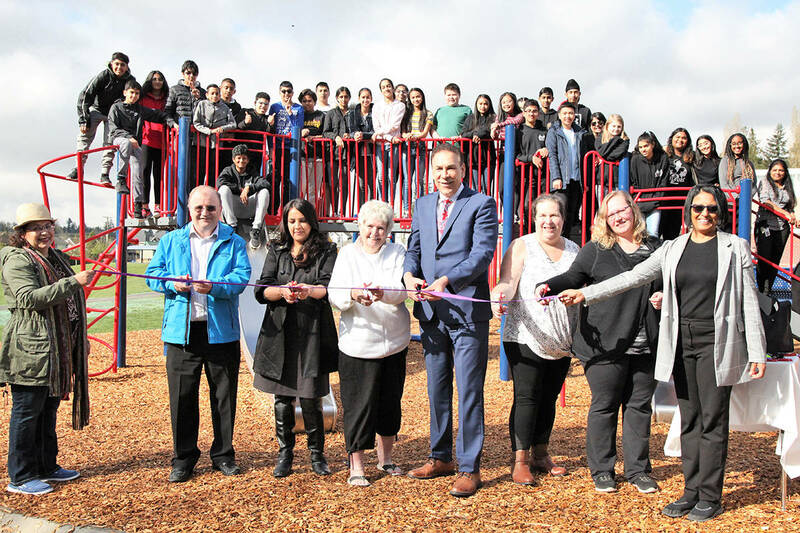 Cora Li-Leger said a “perfect storm” of factors – including co-operation from city officials (after initial red tape) and support from Sources Community Resource Society and the Friends of the Grove organization – combined to make her husband’s long-cherished project a reality. Coun. Vera LeFranc and Surrey-Newton MLA Harry Bains both noted how combined artistic expression and community intervention bring greater awareness to homelessness, while Sources executive director David Young noted the 10th annual Homelessness Awareness March takes place Oct. 16 at Newton Resources Centre at 10:30 a.m.
Li-Leger told Peace Arch News the appropriateness of the site had become increasingly apparent as the house was put together last week. “People in the neighborhood are dealing with issues we don’t see in South Surrey – a lot of people who came by got engaged with the intent of the project,” he said.